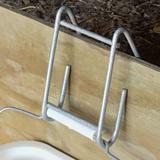 Ideal for use with our bucket teat units for feeding orphan lambs and goat kids. We also use it to carry feed, mineral and water to lambs, goat kids and poultry. 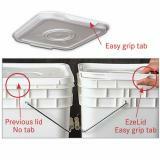 Can be used with our spiral poultry feeder. 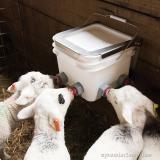 To secure bucket firmly to a wall, use a bucket holder/mount so lambs and goat kids cannot easily knock the bucket around. 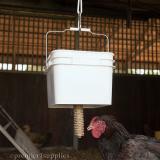 If only feeding a few and looking for a less expensive option, see our Premier bucket holder. 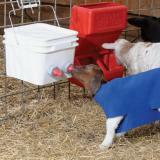 For young goat kids and lambs, use natural latex teats. As the animals get older (about 15 days old) change to red rubber teats as they will not be able to chew through them as easily. 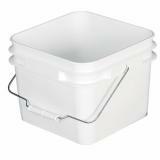 How high should bucket teat units be placed? Not much higher than a mother's own teat (which is usually low). When a nursing ruminant newborn stretches out its neck, the esophagus forms a groove to carry the milk into the fourth stomach. If it doesn't, the milk falls into the first stomach (intended for grass/hay) instead of the fourth. This causes the first stomach to enlarge and form a potbelly. 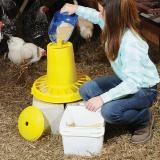 Place the bucket so the teat is as low as the teats on your ewes. 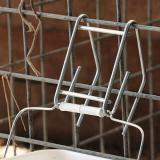 We bought these for individual sheep feeders. They work as hoped. Even a horned ram can put his head in.